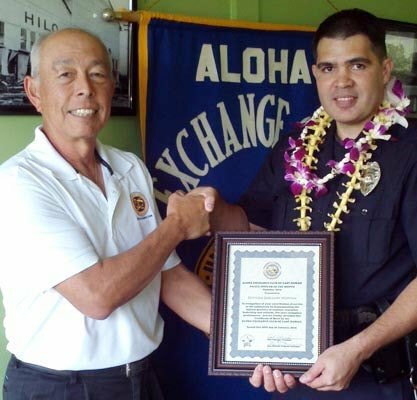 The Aloha Exchange Club of East Hawaiʻi recognized Officer Gregory Horton on Thursday (January 26) as “Officer of the Month” for January. The Puna patrol officer was honored for his work in apprehending an armed man who was wanted on a bench warrant. Horton was one of several officers who responded to a report of a man armed with a .22 caliber rifle trying to break into a home. The man was also wanted for contempt of court. When Horton arrived, other officers informed him that the suspect had fled into the brush with the weapon. As the officers canvassed the area, Horton found the suspect hiding on the floor of a metal shed with his rifle. Horton called the other officers to surround the shed and they arrested him without further incident, preventing him from causing additional harm in the community. The gunman was later charged with terroristic threatening, burglary, assault and a firearm offense. 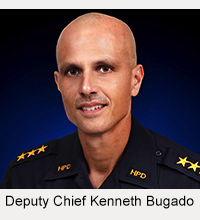 Sergeant BJ Duarte, who nominated Horton for the award, said the incident could have turned tragic if the suspect hadn’t been captured. “Officer Horton’s ability to search out and locate the male, and his willingness to assist his fellow officers makes him highly effective as a protector of our community and a positive role model for fellow officers in our service to the community,” Duarte said. 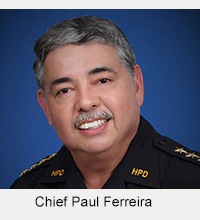 As “Officer of the Month,” Horton is eligible for “Officer of the Year.” The East Hawaiʻi “Officer of the Month” award is a project of the Aloha Exchange Club of Hilo.